DOUGLAS HALL B (Youths) are now back in training. CITY WANDERERS are looking for a friendly on Sunday, 5th Aug and Thursday, 9th Aug.
Any 1st or 2nd Division teams interested please contact Noel on 086-2452418. PEARSE CELTIC are looking for a friendly this coming weekend. Any interested parties please contact Aidan @ 087-3179580. KNOCKRAHA FC are looking for a challenge game this coming Wednesday or Thursday (away). SPRINGFIELD B are looking for friendlies this coming and next weekend. Also interested in playing during the week. Anyone interested, please contact Brian @ 086-2292365. With the season just a few weeks away now, there is still room available for anyone wishing to send stuff in for the Major 8 page Preview - scheduled to go to press on the Evening Echo for Friday August 17th. Once again, here are some suggestions. Please let me have your panel. SEND ON AS MUCH INFORMATION AS YOU WANT. Blarney Street Athletic are looking for a challenge game this weekend. HIBERNIANS are looking for friendlies (home or away) on the 7th, 9th and 12th of August. Anyone interested, please contact: Terry at 086-1519852. GRANGEVALE FC are looking for a Coach\Manager for the coming season. Please contact the following if you are interested in applying for the job. 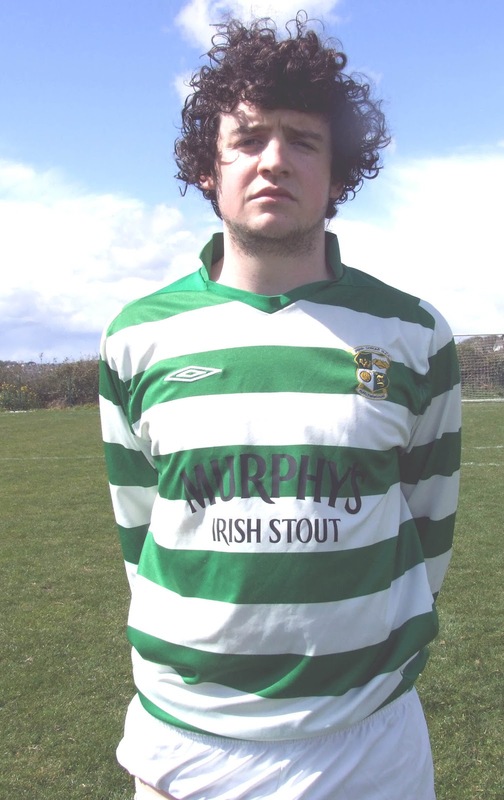 The Cork AUL were proud to learn that Darren Lynch (pictured above) who plays with Park United A in the Premier division of the AUL have been called up by the FAI to join the Irish International junior squad. After turning in some massive performances over the season gone by, this is no more than what Darren deserves and everyone in the Cork AUL wishes Darren the best of success in the times ahead. Darren will come into contention for a place in the Irish team when they take on Northern Ireland on August 23. Brooklodge United are looking for a challenge game away from home next Tuesday night. Anyone interested, please contact Barry Lambe @ (087) 687 1657 to arrange the challenge game. Does your Club / Team require a new home for the 2012/2013 season. We are delighted to offer you a brand new sand based pitch in Glanmire to meet your requirements. Please contact Kevin (0863840515) to arrange a viewing and to discuss usage/cost. Dillons Cross are looking for a friendly this Friday evening at 6.30 in Silverheights. Will also travel if required. If interested, please ring Damien on 086 8453793. Afton Villa FC looking for an away friendly for this Thursday or Saturday. GLEN CELTIC B are looking for friendlies on the 2nd, 9th and 16th August. 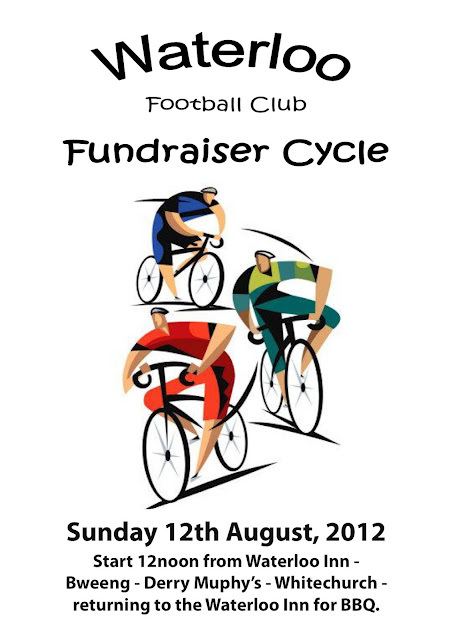 Waterloo have a fundraiser cycle on 12th August with a BBQ afterwards. Sponsorcards for the cycle can be obtained in the Waterloo Inn, Blarney. For more information, call Terence on 086 053 7961. Donoughmore Soccer Club are looking for friendlies on Saturday the 28th of July, Thursday the 2nd of August or Saturday the 4th of August. We have pitch available. Please contact Ted on 086 3772988 or Don on 086 8237294. As usual, we will have a major preview in the ECHO on Friday, 17th. Many thanks and hope your pre-season is going according to plan. Leeds AFC Youths looking for away friendlies against any Youth, AUL or MSL team between now and Sunday 29th. Contact James on 0861992574. The end of year awards night for the club will take place on Friday,10th August in the Radisson Hotel, Little Island. The club has had a very successful year on the pitch last season. A terrific season, after being promoted from AUL 3 the previous season, the club went on to win AUL 2A by 8 pts with 14 wins and 2 draws from 18 league games. In addition, the team did very well to reach the Saxone Cup Final in March but were unlucky to lose on the night to an inspired Ballinhassig team by 2 -0. Credit must go to Barry Lambe, Barry O Sullivan, Martin Farrell & Pat Mooney for making it all possible. Two sets of medals to be handed out the the AUL team with the Players Player and Managers Player of the Year to be given out on the night also. Bbq and DJ on the night, tickets are €20 each and will be available at training or you can contact Club Treasurer Cormac O Keeffe on 085-8235496. The evening will kick off at 7.00 and a great night will be had by all. All family members, partners, new and old players are more than welcome too. CARRIGTWOHILL UNITED A are looking for a friendly this coming Saturday or Sunday away from home. PARK UNITED B are looking for a challenge match from next weekend on and are prepared to travel. Can you please contact Kevin Ronayne @ 086-1054453. Cork Eagles (former MyCork Soccer Team CBSL Shield 2011/2012 winners) are looking for away challenge matches on Sundays from 22nd of July - mornings or afternoons. Please note: There will be a DELEGATE MEETING in the Ambassador Hotel on Wednesday 18th July at 8pm sharp. All Registration and Cup entry forms will be distributed on the night. 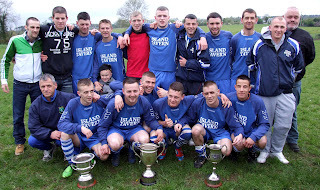 Glen Celtic Football Club has had an amazing 2011/2012 year in its soccer history, following on from their success in the St. Michael’s Cup which they won in April; they also achieved success in the City Challenge Cup and AUL League 1. This is an immense achievement for the Club in this the 40th year of the Glen Community. Glen Celtic FC is holding an Awards Dinner on Saturday 18th August in the Ambassador Hotel to celebrate this great achievement. Tickets for the event are €35 per person and are available to purchases from Chairperson Ann Long (0868692375) or Club Treasurer Mark Kavanagh (0864044557). The closing date for ticket sales is Wednesday 15th August. Glen Celtic FC has 2 Junior Men’s teams and a Ladies team; new members are always welcome to join the Club. The Women’s team is currently looking for new members to increase the squad numbers. The Men’s junior teams have returned to training and are looking forward to the forthcoming season in which they will again strive to achieve further accolades for the Club and Community of the Glen. De courcey Albion looking for home pre season Friendlies. BLARNEY STREET ATHLETIC are looking for a friendly on Saturday 21st July. IN AID OF GLANMIRE MEADOWBROOK FLOOD FUND. Sars Astro pitches: Sat - 21st July 2-6pm. Contact Padraig O'Sullivan on 087-7859314. Its that time of year again, the annual Corkbeg5-a-side kicks off again on the week commencing Monday 23rd of July. Finals night will as usual be Friday 28th July. Team squads of 7 players, 70 euro per team. And we are delighted to welcome the Schooner Bar on board as our new tournament sponsors. So, it doesn’t matter if you have a team of seasoned professionals or a team of utter muck-savages, we don’t care who takes part as long as you have 7 players. This could be a great start to your pre-season training. Corkbeg AFC will return to training this coming Tuesday 17th July at the club grounds in Whitegate. We would also like to WELCOME any NEW PLAYERS interested in playing ball this season to come along as this season is gonna be an exciting one.We will continue to train on Tuesdays & Thursdays at 7pm till further notice. Revised 3rd Division AUL sections. League 3: Afton Villa, Ard-na-Laoi, Ballinhassig B, Castlelack, Greenwood B, Innishvilla B, Parkview Celtic B, Richmond B, St John Boscos C, UCC B. League 3A: Carrigaline Utd, Carrigtwohill B, Dunbar Cel B, Evergreen, Glen Celtic B, Glounthaune, Knocknaheeny Cel, Leeview Ath, St John Boscos B, Tower. League 3B: Buttevant B, Bweeng, Coachford B, Glanworth Utd, Greenmount Rgrs B, Kanturk B, Los Zarcos, Newmarket, Rylane Celtic. GLEN CELTIC B are looking for a friendly on Saturday, 14 July - Home or Away. CITY WANDERERS are looking for a challenge match on Thursday, 19th July and Sunday, 22 July. 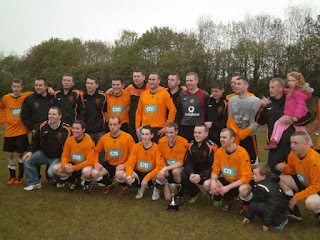 SPRINGFIELD FC will be back training on Thursday, 19th July @ 7pm in Pat O'Brien's Park. For further details, please contact Paul@ 086-3828592. Brooklodge Utd & Riverstown Football Clubs are delighted to annouce that both clubs have amalgamated, to be known as Riverstown/Brooklodge FC going forward. The name change will initially be for both Junior teams (Munster Junior Premier League & AUL 1) and the Under 19s & 17s team (formally Riverstow FC). The amalgamated club will provide the greater Glanmire area with one united club going forward which will cater for schoolboys at all age groups right up to Junior Football. The club would like to Thank all involved in both clubs who have made this happen and this is seen as a progressive move for football in the area. The club would like to invite all players who previously played for Riverstown at schoolboy level, to return and play once again for the new amalgamated club Riverstown Brooklodge FC. Pre Season training for both Junior teams begins tomorrow evening, Tuesday 10th July, at 7.00 up in the GACA, Brooklodge. The club would love to see familiar faces back playing for the club and would like to invite all players seeking to play for the club to come training. Training each week will be Tuesday & Thursdays at 7.00 up in the GACA, Brooklodge unless otherwise notified here. The club would like to urge all players considering returning to play to come along to training, get involved and take it from there. VILLAGE UNITED are looking for a challenge match next Saturday 14-July. BROOKLODGE UNITED are back training next Tuesday & Thursday up in the GACA, Brooklodge @ 7.00. All new players are welcome, contact Barry Lambe for further details @ 087-687 1657. Knockavilla, Macroom, Park Utd, Pearse Celtic, Springfield A. League 1: Ballinhassig, Brooklodge Utd, Cathedral Celtic, Crescent Ath, Dillons Cross Ath, Fairview, Knockraha, Springfield B, Village Utd, Watergrasshill. League 1A: Buttevant A, Glenthorn Celtic, Glenvale, Grangevale, Greenmount Rgs, Millstreet Celtic, Rathcoole Rvs, Richmond A, UCC A. League 2: Ballincollig, Blackpool Celtic, CFC Banteer, De Courcey Albion, Killowen, Donoughmore Ath, Lakewood, Macroom, Strand Utd, Waterloo. League 2A: Central Rvs, Churchvilla, City Wanderers, Corkbeg, Dunbar Celtic, Hibernians, Hillington, Park Utd B, Shandon Celtic, St. John Boscos A. League 3: Afton Villa, Ard-Na-Laoi, Ballinhassig B, Castlelack, Greenwood B, Innishvilla B, Parkview Celtic, St. John Boscos C, UCC B. League 3A: Carrigaline Utd, Carrigtwohill B, Dunbar Celtic B, Glen Celtic B, Glounthaune Celtic, Knocknaheeny Celtic, Leeview Ath, St. John Boscos B, Tower. League 3B: Buttevant B, Bweeng, Coachford B, Glanworth Utd, Kanturk B, Los Zarcos, Newmarket, Richmond B, Rylane Celtic. Click here for Application Form for any potential coaches who may wish to work in The Cork Youth Leagues Academy due to begin in September next. Forms to be returned to John Finnegan, 6 Lynbrook, Glasheen Road, Cork City. Next Youth Delegate Meeting is on Monday 16th July at 8pm in Ballyphehane Community Centre. HIBERNIANS FC are back in training for the new season on Tuesday, 10th July in Shanbally at 7pm. New players are more than welcome.